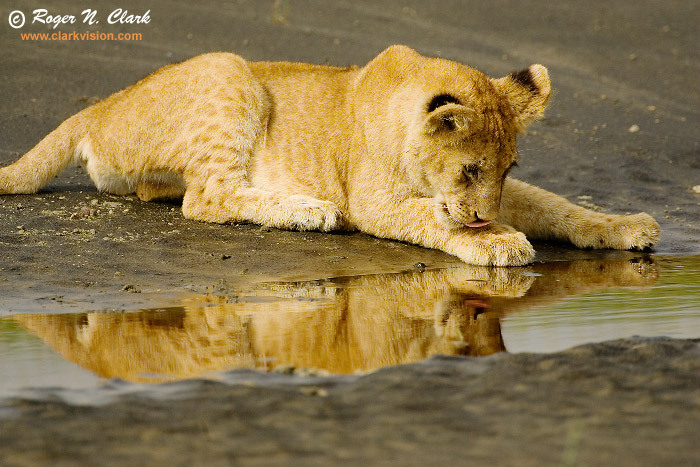 A lion club stares at his reflection. Ngorongoro Conservation Area (NCA) woodlands, on the edge of the Serengeti, Tanzania, Africa. Technical: Canon 500 mm f/4 L IS lens plus a 1.4x teleconverter giving 700 mm at f/5.6. Exposure: 1/1250 second at ISO 200. Full image, no crop. Wild and free. No calls or bait were used to acquire this image. To learn how to obtain stunning images like this, please visit my Extensive Articles on Photography . All images, text and data on this site are copyrighted.